In the Villa Floridiana, work of the neoclassic architect Antonio Nicolini, there is an precious collection of objects of applied art collected by Placido De Sangro, duke of Martina. De Sangro gathered, from 1860, glasses, corals, ivory, objects in leathers, enamels, snuffboxes and above all a splendid collection of majolicas and chinas. There are also Neapolitan sketches of '700 and pieces of furniture. 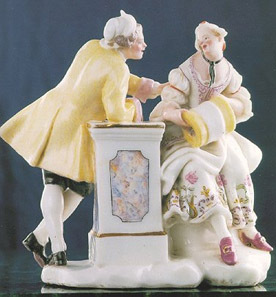 At the first floor are kept the chinas of European manufacture, such as the collection of the manufacture of Meissen, of Capodimonte and of Naples during the Bourbon period, of the marquis Ginori a Doccia, besides the French, German and Viennese chinas. Important is the splendid collection of eastern art with chineses and Japanese porcelaines, bronzes, jades and enamels. At the ground floor a collection of Renaissance majolicas, of the seventeenth-century and Hispanic-Moorish.